Done using a MagnetoSpeed Sporter with the start sensor approximately 1.5 inches from the muzzle. Next runs will work a couple of tenths either side of that 31 and also 5 more at 31 to see if it repeats. I'll take a SD of 6.3 most any day for a start and see if it can be made better. All loads were done using my Lee deluxe PM and verified on a scale at the first case in the string and the last. I've found the measure to be very consistent. Here is everything I shot, a summary of 27 different loads, with my Rio Grande 38-55 by JES. My groove diameter is .376", at my request, and I shoot a .378" bullet. The bullets were cast with a 95% WW and 5% tin in order to approximate Lyman #2. They were water quenched and have held a 21 BHN. I've included the case fill capacity because we are using a similar weight bullet with the only difference possibly being bullet length. Given that, using the same fill capacity, vs. charge (probably varies a tenth at the most), would give the same pressure results. My target PMax was 40K which the top end of each load approached. They all shot good which made it difficult to select "THE" load. 33.0-grains of H4198 won as it delivered over 2000 FPS (2018 FPS) with its five-shot group maintaining 1.5 MOA out to 200 yards. RD do you know off hand if NOE catalogues this mold? Apparently not, most of my designs have disappeared from his lineup. The Accurate 38-345R seems to be my design. Why not the Lee 379-250-RF? Given the pressures you are shooting, a plain base would be fine. As far as molds prices go, you cannot beat it. 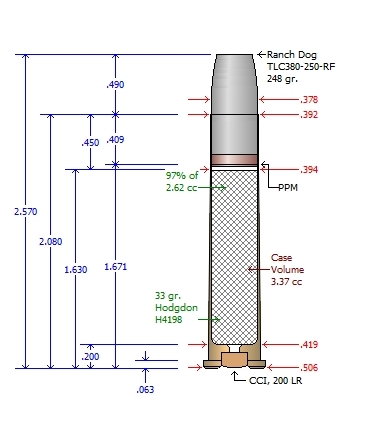 Ranch Dog wrote: Why not the Lee 379-250-RF? Looking at that and also thinking about getting a box of Penn Bullets. I've shot a lot of his 180 grain 357 bullets in the 357, 35 Remington and 357 Herret with no complaints. Ranch Dog wrote: Apparently not, most of my designs have disappeared from his lineup. Ranch Dog wrote: Here is everything I shot, a summary of 27 different loads, with my Rio Grande 38-55 by JES. My groove diameter is .376", at my request, and I shoot a .378" bullet. The bullets were cast with a 95% WW and 5% tin in order to approximate Lyman #2. They were water quenched and have held a 21 BHN. Well, I finally got my Missouri Bullet shipment so getting on to more load work. H4198 this time. This bullet is .909 long and seated to the crimp groove the OAL is 2.6. No gas check but Hytek coated. Nominally .379 and thus far no signs of leading from the 200 rounds or so that have gone down the tube. The Lee mold is close to top of the list. Put together a ladder working up to the 33 grains of H4198. Now to find some range time. Range day. Hour and a half drive but worth, the rain stayed away wish I could say the same for the wind. Went over there to run the ladder with 4198 and the MoBull 245 grain coated and to shoot a little black powder cartridge. Before I go any further along here a big thank you to Michael for passing his 38-55 summary along. Turns out the 33.0 grains of 4198 was just the ticket. I didn't try for a group as the wind had the target swaying back and forth and at times felt like it was going to blow me off the bench. The numbers look like a good start so maybe next week without the wind. I should add in here that these were loaded in twice fired StarLine cases to a COL of 2.6.